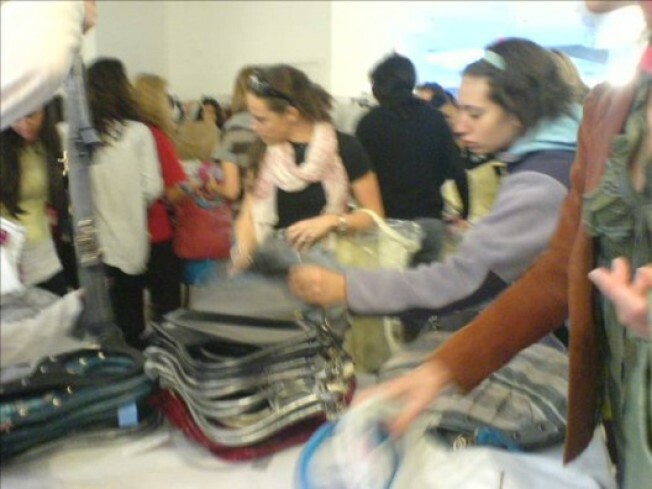 The Foley & Corinna sample sale at 146 Orchard Street opened to an eager group of 30 to 50 shoppers this morning, all there for the same reason: to buy the brand's soft leather totes. When staffers opened the doors, everyone raced in, threw their own handbags in a corner, and ran over to the tables of purses at the back of the space. Racks of summery dresses and tops went practically untouched, as ladies (and a few guys) grabbed up armfuls of the bags. Canvas and leather versions started at about $120, while all-leather styles were around $200—a significant markdown considering they retail for $400 to $500. The clothing (as if anyone cared) seemed a bit pricey for a sample sale: The cheapest pieces we found were floaty, spaghetti-strap tops for $50; most items were priced from $75 to $200. When we left, F&C staffers were rushing in a slighted group of about 20 women who had been waiting outside the boutique at 114 Stanton St. Next time, a sign redirecting people would be a good idea.